Already finished Camper Pillowcase. No work to be done! Janet is selling her extra projects from Facebook live. Ready to keep for yourself or give away as a gift. 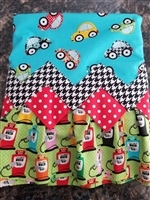 Already finished VW Pillowcase. No work to be done! Janet is selling her extra projects from Facebook live. Ready to keep for yourself or give away as a gift.